Product uses: Silver-flo™ 55 can be used to join all the common engineering materials (excluding aluminium) such as copper, copper alloys (including, brasses, bronzes, gun metal, nickel silvers, aluminium bronze, copper nickel), steels including, mild, carbon, tool steel, stainless steels, low alloy steel), tungsten carbide and PCD segments. 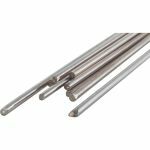 On large or difficult to wet tungsten carbide pieces specialised silver brazing filler metals containing nickel / manganese are often preferred. Conditions for use: This filler metal is mainly used for brazing in air with a flux. In most cases Easy-flo™ flux can be used in conjunction with Silver-flo™ 55. However, flux selection is application dependent. Please refer to JM technical department or flux product datasheets before selecting a flux.